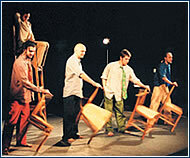 The first week of July welcomes the 4th annual international show of independent and amateur theater, IV.v MB(apostrof)99, Praha 2002. This was the first festival to focus on meetings between Czech amateur and independent theater and their peers from abroad. This year, 19 ensembles from Europe – including Mozaik from Macedonia, and Puls Performing from Denmark – and several groups from Brazil (Tespis, Cía de Teatro, Itajaí) will make an appearance. Czech theater will be represented by the likes of Divadlo Líšeň (Brno), the Lucerna MB ensemble (Prague), which is the show organizer, and De Facto Mimo (Jihlava). Now in its sixth year, the “Střelecký OSTROV 02” festival program will feature new regular Thursday Combined Evenings with music and theater and Sunday Film Club movies, in addition to the daily film screenings. This year’s selection of films was based on experience from previous years, when the most successful films were those that had become cult favorites. Festival visitors can look forward to Saturday Monty Python film series, and films such as Kouř (Smoke), The Matrix, Sky Over Berlin, The Great Feast, Fear and Loathing in Las Vegas, and others. 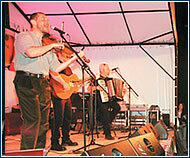 Look forward to concerts by Phil Shöenfelt & Southern Cross, Ta Jana z Velké Ohrady, Garage, Jiří Schmitzer, and other surprises.Theatrical ensembles appearing on Střelecký ostrov include Divadelní Studio Čisté Radosti and others. Three photographers Ivan Luttterer, Jan Malý and Jiří Poláček, and their colleagues Bohdan Holomíček, Antonín Malý, Zdeněk Merta, and Stanislav Tůma, are the main actors in the seventh consecutive common exhibition of a loose cycle thematically focused on the Lesser Bank and Hradčany – Malostranské portréty (Lesser Bank Portraits), which is installed for the summer in Obecní galerie Beseda. For the second year, this very successful exhibition is called Malostranský portrét, and before that it was called Lesser Bank Corners, The Lesser Bank Today, and Lesser Bank Figures. As opposed to the “figures”, this time the exhibition presents well-known Lesser Bank personalities of the past and present – such as Václav Havel, the first time he was elected president. The installation of the entire cycle, in which more than 30 photographers have been involved over the last six years, was organized by Stanislav Tůma.